Rany on the Royals: Top Moments (#40 - #36) of the 2014-2015 Kansas City Royals. Summary: Eric Hosmer breaks a tie in the 5th inning with a two-out, two-run single in Game 2 of the World Series. Eric Hosmer has 27 RBIs in 28 postseason games. I'm not putting any meaning on that, but it's a hell of a fact. The Royals have had four two-out, two-run singles in the last two postseasons. Two of those hits were bases-loaded singles while the Royals were running up the score against Toronto in Game 4 of the ALCS, with nine runs in the last three innings. One of those hits was Omar Infante’s tie-breaking bases-loaded single in Game 4 of the 2014 World Series, which ranks as Moment #142 even though it came in a loss. This is the fourth occasion. The Royals had already tied Game 2 of the World Series in the 5th inning against Jacob deGrom when Alcides Escobar’s inability to get a bunt down turned into an RBI single (Moment #53). But deGrom got Ben Zobrist to bounce out, moving the runners up to second and third, and then Lorenzo Cain lined out to center field, too shallow for Alex Rios to tag up. So Eric Hosmer batted with two outs and two runners in scoring position. On an 0-1 pitch, he stayed back on a changeup from deGrom and ripped it straight up the middle, bouncing off the mound and then just past the outstretched glove of Wilmer Flores, who was shading Hosmer to pull. Two runs scored, and the Royals had a lead they would hold onto for the duration of the game. Kendrys Morales and Mike Moustakas (Moment #186) would single to bring Hosmer around to score, and a suddenly shell-shocked deGrom would not come out for the 6th inning. The narrative – that the Royals had the antidote to the Mets’ murderous row of starting pitches – had solidified, thanks to another clutch hit from Hosmer. Summary: Alcides Escobar kicks the ball away when the Orioles try to throw him out at the plate in the 1st inning, resulting in two runs in a game the Royals would win, 2-1. The Royals held a commanding 3 games to 0 lead in the 2014 ALCS, and were looking to land a knockout blow early in Game 4. They got one in the 1st inning, when Alcides Escobar led off with an infield single, and then Miguel Gonzalez hit Nori Aoki with a pitch. So Eric Hosmer batted with runners on second and third and one out, in position to drive home a run without benefit of a base hit. But the Orioles pulled their infield in, and Hosmer hit a chopper right at first baseman Steve Pearce. Escobar was running on contact, so Pearce threw home to Caleb Joseph, who made a swipe tag as Escobar crossed the plate. Ever since the plate-blocking rule passed before the 2014 season, home plate collisions of any consequence whatsoever have been nearly eliminated, which makes this play so unusual: Escobar appeared to kick the ball out of Joseph’s glove, something which isn’t supposed to be allowed anymore. The same shadows which made hitting at that time of day so difficult – and which made an early lead even more meaningful – hampered Joseph’s ability to field the ball cleanly. Instead, Escobar slid into home safely, the ball kicked away and nearly hit Billy Butler in the on-deck circle, and Aoki came around to score as well. The Royals scored two runs in the inning on one hit. They would be the only two runs the Royals would score that day. They would be the only two runs the Royals would need. Oh, and how did Escobar and Aoki end up on second and third with one out? Because Lorenzo Cain sacrificed the runners over. Why is this meaningful? It is the only sacrifice bunt of Lorenzo Cain’s major league career. Ordinarily I wouldn't recommend bunting with a guy who's hitting .667, but I now fully expect this to lead to a 7-run inning. You might remember Cain trying to bunt in the 8th inning of Game 1 of the 2015 World Series after Ben Zobrist doubled (Moment #147), and how badly that turned out. But the one and only time Cain has ever successfully laid down a sacrifice bunt in his major league career, it worked to absolute perfection. You literally could not draw up a more picture-perfect sacrifice bunt than the one that moves two runners up a base, and both runners score when neither of them likely would have scored had the batter made a routine out instead, and you win the game, 2-1. If you put that in a movie script you’d get laughed out of the Writers Guild. Oh, and winning the game put your team in the World Series? Please. No one would ever believe such a ridiculous tale. 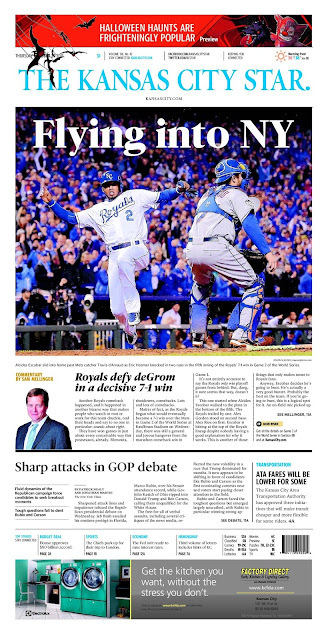 Summary: Mike Moustakas singles past a diving Daniel Murphy to bring home the go-ahead run in the top of the 8th inning in Game 4 of the 2015 World Series. Daniel Murphy was the MVP of the 2015 NLCS, an easy selection after he went 9-for-17 in the series with four home runs, becoming the first player ever to hit home runs in six consecutive playoff games. Had he won World Series MVP honors, he would have finished maybe the greatest postseason anyone has ever had. He did not. However, speaking as a Royals fan, I am here to propose a scorching-hot take: did Daniel Murphy actually deserve to be named World Series MVP? Consider the evidence: he hit .150 in the series, with just three singles in 20 at-bats, and no RBIs. (He did walk five times and score two runs.) And his defense greatly abetted many a Royals rally. Exhibit A is this inning, the top of the 8th inning in Game 4. Murphy had already booted a slow ground ball off the bat of Eric Hosmer that tied the game, when on the next pitch, Mike Moustakas hit a medium-speed groundball to the right side that Murphy…just…couldn’t…get to. The ball got through for a single, the Royals had the lead, and they would tack on an insurance run when Salvador Perez followed (Moment #118) with yet another single. With one out, Moustakas’ grounder would have scored the go-ahead run even if Murphy had been able to snare it and throw him out at first, but of course, there was only one out because Murphy had just flubbed Hosmer’s grounder. And had there been two out, Murphy likely would have been playing a little farther back, giving him a little more time to get to this grounder. Murphy had more to do with the Royals’ game-winning rally in Game 4 of the World Series than anyone else. That wasn’t enough for him to be named the Royals’ Most Valuable Player, but if it’s any consolation, at least one Royals fan acknowledges his contribution with the heartiest of thanks. Summary: Yoenis Cespedes, representing the tying run, makes a terrible baserunning blunder, allowing the Royals to double him off first base and end Game 4 of the 2015 World Series. For all that we talk about how the Royals won a world championship by taking advantage of their opponents’ mistakes on defense, we should also mention that the Royals also took advantage of their opponents’ mistakes on the bases. For instance, this play, when Yoenis Cespedes suffered a momentary case of brain-lock at the worst possible time. The Royals had taken a 5-3 lead in the 8th inning in large part because Terry Collins chose not to turn to his closer, Jeurys Familia, to start the inning, waiting until two batters had walked against Tyler Clippard first. Ned Yost made no such mistake; he brought Wade Davis in to start the 8th inning even though he had Kelvin Herrera as an option. Davis retired the Mets in order on 12 pitches, and then stood at home plate and watched four pitches go by in the top of the 9th. He struck out David Wright to begin the bottom of the 9th, but then Daniel Murphy beat out an infield single, and then Cespedes singled to right field to put the tying runs on base. The Wade Davis Experience. Is. Killing. Me. But Davis takes a back seat to no one when it comes to actual runs allowed because he’s at his best when the situation is at its most fraught. With runners in scoring position last year, batters hit .118 (6-for-51) against Davis, all singles. In 2014, they hit .150 (9-for-60) with runners in scoring position, albeit with a double and even a triple. Davis isn’t the best reliever in baseball because he prevents rallies from starting; he just prevents them from finishing. And amazingly enough, this wasn’t even the highest-rated baserunning mistake made by the potential tying run in the 9th inning against Wade Davis on our list. As per usual, you make my day with these. Sometimes, when you post a youtube jump, I just keep watching the game at my desk. Great stuff. Thanks for the memories. I love re-living all the special moments from 2015. But to be honest, I skip over the 2014 moments because it's too painful to be reminded that the season ended in crushing disappointment. 1) I finally just rewatched the Wild Card Game all the way through. I get K-Funk's feeling, but this process - reliving 2014 and 2015 at the same time - made me get the whole Rocky I/Rocky 2 (minus the cheese) vibe of what happened. I might be sold on a storyline of just falling short and then redemption being sweeter than back-to-backs. I might be crazy. 2) I love that Daniel Murphy fell apart right around the same time the Westboro Baptist Church began singing his praises. Murphy for WS LVP! Though Cespedes with his fielding and his unfortunate inability to hit through a crippling injury might be a contender. 3) TOOTBLAN is the best baseball acronym, and a contender for best acronym overall. 4) All the little moments that led us to having 35 more moments to watch. OMG so many things have to fall right! I share your concern about Hosmer celebrating too early. I swear that on this play, and one other this post season, he did come off just a bit early. I actually don't get K-Funk's feelings about 2014 at all (and I think Rany agrees with him too). 2014 is nothing but pure unadulterated joy to me. In some ways even better than 2015 (but not really). The undefeated streak through the AL playoffs, the Wild Card game, taking the WS to Game 7, all these things rank almost as highly in my book as winning the WS. C'mon, we went from 29 years of futility to one of the great playoff runs of all time. It was ALL gravy! And it even ended in spectacular fashion! As Gordon rounded second, I actually thought to myself, "They really are magic!" So, it ultimately ended in a loss, but to me, being disappointed by the way the 2014 playoffs ended is like saying "Yeah, I won the billion dollar Powerball, but I still have to pay the taxes on it." One moment I thought could be on the list (way further down, but somewhere on it) was Lorenzo Cain's RBI double off Clayton Kershaw in the 2015 All-Star Game. With all the talk that Royals fans were going to cost the team homefield advantage by voting in all their players, it was fun to see Royals players contribute in a big way to an AL victory.